Amy Hill was a VAD nurse. 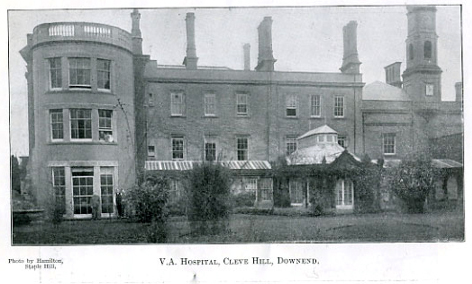 Cleve House, near Frenchay, then owned by Mr and Mrs Cave, was converted into a hospital and used throughout the war for convalescing soldiers. It was staffed by Red Cross nurses of the local VAD or Voluntary Aided Detachment. The soldiers being treated wrote poetry, drew cartoons and sketches in Amy’s autograph book. This surviving artefact tells us about l life in the First World War through these poignant images. Students are encouraged to write or draw a response. 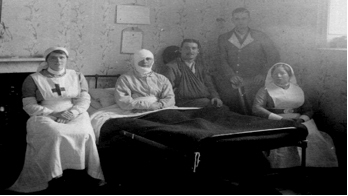 Wounded soldiers would come off the hospital trains with the mud of Flanders still on them. Nurses like Amy had to clean them up and look after them. Some of them were only 17 years old or less, most were 19 years or older. Women were not allowed to fight, so this was something Amy could do. This resource encourages a student’s response to the work of the wounded soldiers in Amy Hill’s autograph book. They drew cartoons and wrote poems to pass the time in this poignant artefact. These soldiers would come off the hospital trains with the mud of Flanders still on them. VAD nurses like Amy had to clean them up and look after these young men who had experienced so much. Introduction sheet and 6 different images with suggestions and helpful links to inspire.